Image caption Is that me? Nico, developed by computer scientists at Yale University, will take the test in the coming months. The ultimate aim is for Nico to use a mirror to interpret objects around it, in the same way as humans use a rear-view mirror to look for cars. "It is a spatial reasoning task for the robot to understand that its arm is on it not on the other side of the mirror," Justin Hart, the PhD student leading the research told BBC News. So far the robot has been programmed to recognise a reflection of its arm, but ultimately Mr Hart wants it to pass the "full mirror test". The so-called mirror test was originally developed in 1970 and has become the classic test of self-awareness. More usually performed on animals, the creature is given time to get used to the mirror and is then anesthetized and marked on the face with odourless, non-tactile dye. The animal's reaction to their reflection is used as a gauge of their self-awareness, based on whether they inspect the mark on their own body, or react as if it does not appear on themselves. To date, only a few non-human species pass these tests, including some primates, elephants and dolphins. Human babies are unable to pass the test until they are 18 months old. Increasingly scientists have used similar tests to analyse self-awareness in robots but none have yet programmed a robot to fully recognise itself from appearance alone. "This is based on appearance rather than motion. I'm trying to pass the full mirror test," said Mr Hart. A study in 2007 saw a robot able to distinguish movements in a mirror by classifying pixels either as belonging to it or to others. 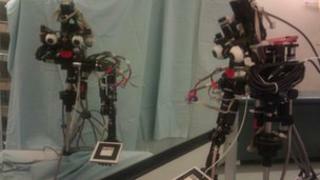 Later studies observed how a robot imitated tasks of other robots versus imitating itself in a mirror and most recently the Qbo robot was programmed to react to different images - responding to specific images of itself with the phrase: "This is you, Qbo." Mr Hart, who is working on the project with his supervisor Brian Scassellati, will publish his findings in the spring. "This is an important step but it is not the endgame of artificial intelligence, it is just a step along the way," he said.